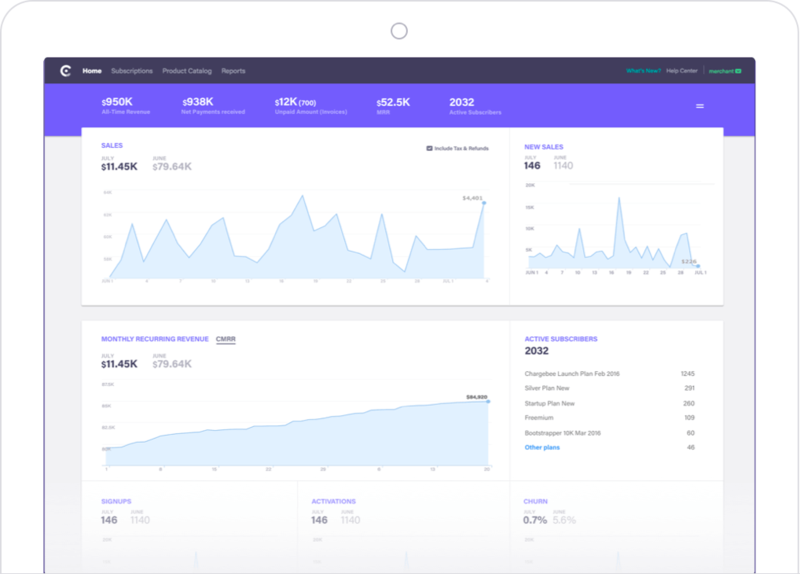 Chargebee: Product Features and Capabilities that help you in your Subscription Business viz. SaaS and eCommerce. Explore what Chargebee brings to the table. Managing recurring billing and payments is no more complicated. Create, manage, pause, cancel, reactivate and extend subscriptions with ease. Handle upgrades and downgrades at any point in the billing cycle. Keep customers engaged with automated emails throughout the journey. Experiment with Chargebee's flexible 'plans and addons' product catalog until you the find the best way to monetize your offering. Automatically include addons with a specific plan when there's a plan activation or change. Offer the right upsell at the right time with recommended and mandatory addons. Manage trials and any unexpected edge case it may throw at you. Customize trial periods, extend trials indefinitely, automate trial ending reminder emails and offer free/paid trials. Using Chargebee’s Email Notifications, emails can be triggered for subscription, recurring payments & invoice, customer retention and self-service related events to specific segments of customers. Create and track one-time, unlimited, or time-defined coupons easily, and drive more revenue. Choose between percentage and flat-fee discounts. Generate bulk coupon codes to run successful campaigns. Streamline operations for your eCommerce with Chargebee's Recurring Orders. Automatically generate, schedule and manage subscription orders within Chargebee. 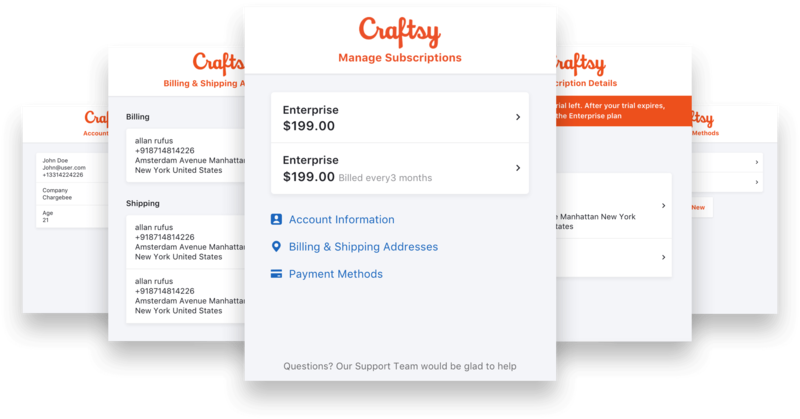 Up your subscribers with what is an easy and economical customer acquisition tool — gift subscriptions. Allow the gifter to append a personalized message with the gift and schedule it for an occasion. Set up single-step gift claims and one-click extensions, and acquire more recipients. Customize recurring billing cycles any way you want to. Don't restrict yourself to traditional monthly and yearly cycles. Automate your recurring invoicing. Tailor invoices with the right share of clarity, security and compliance. 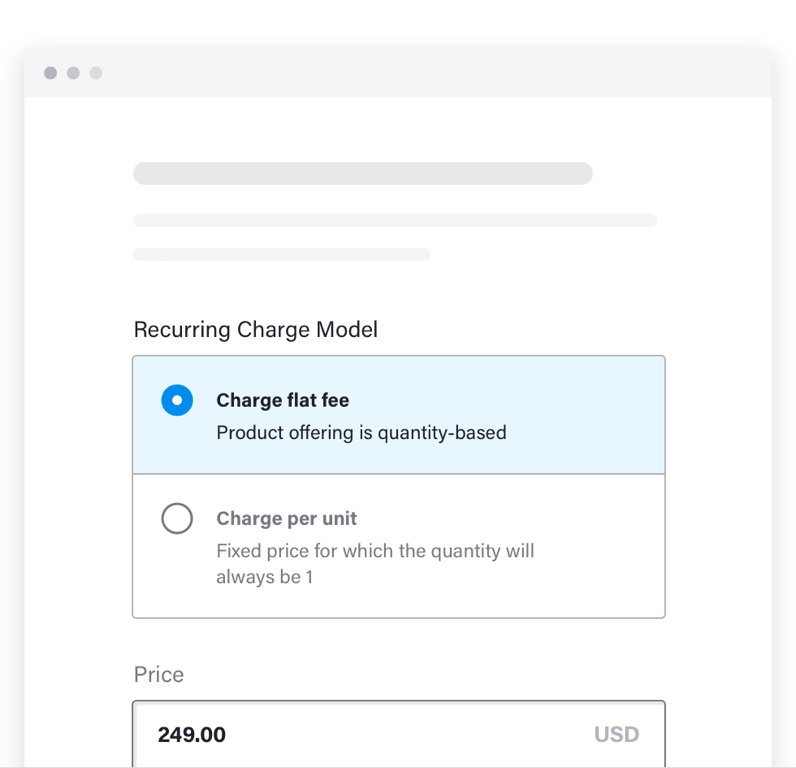 With Chargebee's custom invoices feature, plan and budget better by raising invoices a pre-set number of days in advance of the subscription renewal date. Allow customers to review invoices and arrange for payments. Set a payment term of ‘x’ days before the payment comes through. Charge customers for what they use or add overages to a base fee. Feed in your business-specific logic and let Chargebee take care of the calculations. Defer the invoicing of any subscription changes in the middle of the subscription billing cycle to the next renewal. Adjust bill amounts to accomodate mid-cycle upgrades/downgrades. Reflect changes in MRR instantly with accurate real-time metrics. Send a Proforma Invoice for approval to let a potential buyer carry out their internal purchase approval processes before they commit to the purchase. Consolidate charges in a single invoice to send to a customer with multiple subscriptions. Or when the payment for all subscriptions within an organization has to go out to the person in charge of payments. Offer adjustment and refundable credit notes for recurring invoices when there are chargebacks, writeoffs or a subscription change. Have a clean record for filing tax returns. Decide which day you want to charge your customer irrespective of when they sign up. Personalize renewal dates for customers based on their requests. 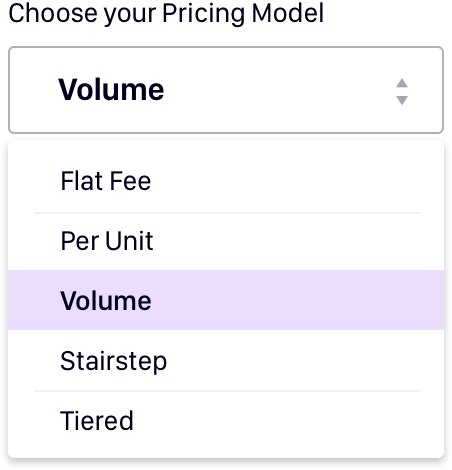 Choose between flat fee, per unit, tiered, volume and stairstep. Permute and combine different plans and addons to create complexly hybrid subscription pricing models. Let your existing customers be unaffected by your pricing changes. Make the changes applicable only to new customers. Let negotiated deals effortlessly translate into subscriptions with Chargebee's price override. Personalize offers that help customers derive utmost value for your service. Chargebee offers a reliable and frictionless checkout experience for your customers that can go a long way in boosting conversions. Start quickly with Chargebee's PCI compliant hosted checkout page/in-app checkout to collect payments, customize and rebrand, and deliver a smooth checkout experience. Chargebee's Self-Serve Customer Portal allows your customers to manage their subscription, view previous invoices, update billing or payment information and much more by themselves. Enable a quick checkout for your returning users by auto-filling information like billing, shipping address, payment methods and much more. Abandoned cart tracking allows you to measure how many visitors/customers leave the checkout without completing a purchase, leaving items in the cart. The cart abandonment reports are a comprehensive source for tracking lost revenue and dropped checkouts. Let your customers checkout without having to sign in every time. Chargebee will identify your existing customers from their email id and lets them skip the sign-in process and checkout instantly. Chargebee is PCI-DSS Level 1 certified. Chargebee encrypts and protects your customer's sensitive personal and card data information is encrypted and handled in a safe and secure manner. Chargebee's Consent Management gives you powerful ways to capture and manage consent information from your customers. Flag your customers of fraudulent transactions from suspicious IP address. Chargebee's fraud detection system marks a transaction as fraudulent if a charge is not authorized by the card owner. Chargebee's EU-GDPR compliance allows you to work with a very robust and secure system architecture to prevent unauthorized access and processing of personal data. Modern privacy laws require that personally identifiable information (PII) not be retained in systems longer than is necessary for meeting business needs. Chargebee lets you delete PII when your customer is no longer using your service. Curious to see what's under the hood? Chargebee integrates with popular payment gateways and methods for your business to securely accept recurring payments, both online and offline. Make it easy for your customers to pay you, so there are no excuses to drop-off. Choose from 20+ payment gateways for recurring payment processing. Quickly start accepting payments online while Chargebee takes care of security and customer payment experience. Chargebee lets you accept recurring payments from your customers with their choice of payment method. Reach new markets globally, scale your business and increase conversions. Monitor credit card declines, reduce churn and recover lost revenue with Chargebee's dunning capabilities. Minimize payment failures with smart payment retries, automatic card updater and custom dunning email notifications. Configure multiple payment modes as well as backup payment methods such as PayPal, or Braintree, along with your primary payment method to ensure guaranteed revenue. Request payment from customers via emails with Chargebee and get all your unpaid invoices paid instantly. Facilitate global transactions at scale with a great deal of personalization. 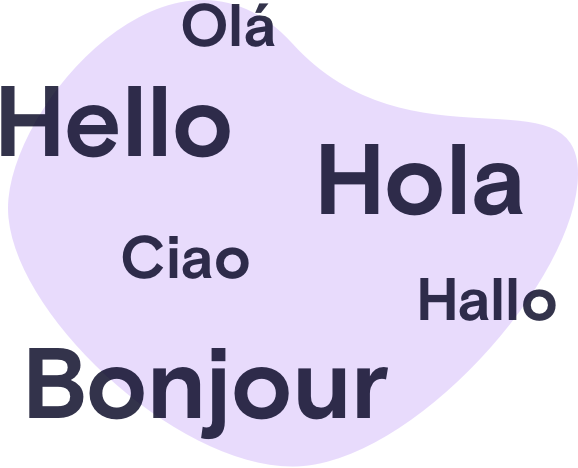 Chargebee's multi-language and multicurrency payment support allows your customer to pay in their local currencies and takes you closer to winning the global susbcription game. Facilitate global transactions at scale. Connect multiple accounts of the same payment gateway with the Smart Routing feature. Configure rules for automatically picking a gateway account based on the payment method that the customer chooses and the currency of the transaction. Global tax rules are constantly evolving. Don't be burdened by messy tax compliance invoicing rules. Let Chargebee automate the tax management depending on where you are selling. RevenueStory sits on top of Chargebee billing system for an end-to-end subscription analytics and intelligence. Benefit from access to over 80+ custom reports, role-specific dashboards, shareable reports, threshold alerts, and goal tracking, besides a comprehensive subscription billing service. Benefit from the monthly reports that can be used for accounting purposes, including sales, discounts, bad debts, and reversals. Chargebee's GAAP-compliant Revenue Recognition and Deferred Revenue reporting accurately simplifies complexities in accounting and finance for businesses of all shapes and sizes. Track how your subscriptions, product catalog, and revenue, impact each other to drive your growth. Dive into the deepest granularity of your subscription metrics to make calculated decisions. Empower your support team to offer relevance in their conversations with a 360-degree view of your customers in helpdesk with Chargebee's integration with popular helpdesk providers. Chargebee weaves tax management and subscription payments in its integration with Avalara. Handle EU VAT and reflect them in the invoicing and accounting segments of your business finance. Sync subscribers to your mailing lists, segment them and send targeted marketing emails using Chargebee's integration. Benefit from Chargebee’s reporting, tracking and analytics integrations in real-time, for your subscription business. Chargebee enables you to build custom integrations with apps that are supported by Zapier and PieSync. Sync with as many apps as you want from the plethora of integration options offered by these platforms. With Chargebee's CRM integrations, your sales team can bridge the gap between sales and subscriptions. Automate everything from nurturing, onboarding and billing, to having contextual conversations with your customers during renewals. Accounting recurring payments is seamless with Chargebee's integration with leading accounting solutions. Sync customer details, avoide duplicate records, generate relevant reports, and handle billing, payments, and accounting in one plane. Run referral & affiliate marketing campaigns for targeted lists from your subscriber base. Collaborate with your team and customers, with better context. Get notifications on subscription related events like overdues, renewals etc. and engage with targeted customers for seamless payments and subscription management. Take advantage of Chargebee's integration with internal collaboration tools. Let Subscription Orders flow from Chargebee to your fulfillment platform without any manual triggers. Try your hands on Chargebee's capabilities. Experience Chargebee.